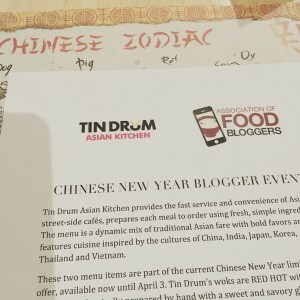 A few weeks ago the Association of Food Bloggers extended an invitation to us to attend a bloggers’ tasting at the Tin Drum Asia Café. 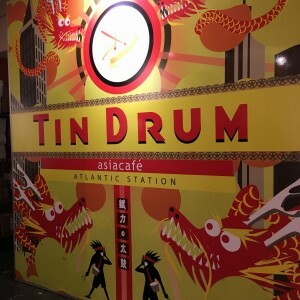 The Tin Drum Asia Café is a concept called fast casual dining. Fast Casual, is one of the fastest growing restaurant segments. 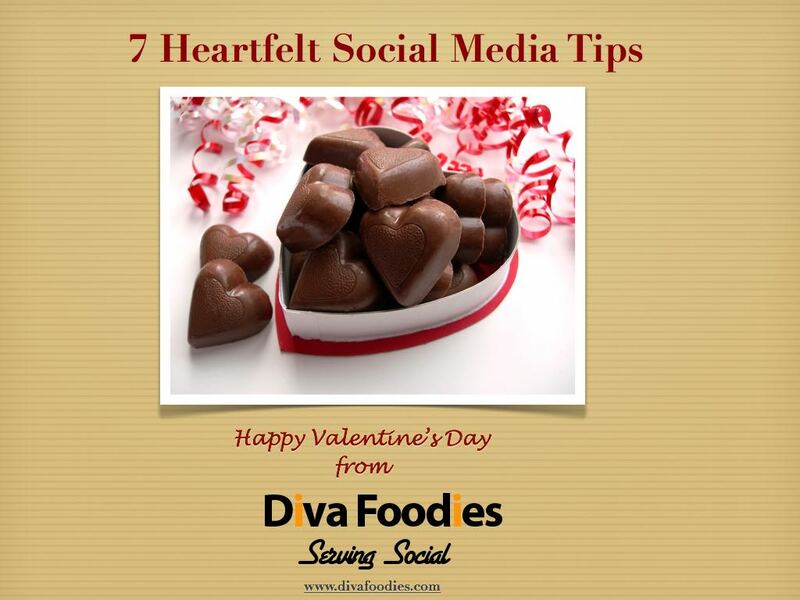 The concept is positioned between a Quick Service Restaurant (QSR) a la McDonalds and fine dining. Typically fast casual food restaurants serve fresh food, frequently prepared to order, provides some customization and has minimum table service. One might argue that the ingredients are higher quality than QSR. Fresh veggies were indeed incorporated into the dishes at the Tin Drum Asia Café. Tin Drum Asia Café’s has an interesting back-story. It begins with Steven Chan who founded the restaurant in 2003 while at Georgia Institute of Technology AKA Georgia Tech in Atlanta. The menu was inspired by the cuisine from the streets of Asia. Food reflects flavor profiles from Vietnam, India, Japan and China. The name Tin Drum is taken from the legend of the drummer who called villagers to eat their morning meal at local cafés. To continue to bring diners the environment of the streets of the East, Chan choses the music you’ll hear based on the tempo of the beat. He feels the music adds to the excitment of your culinary experience. So, with an interesting restaurant concept that is coupled with an intriguing story I was looking forward to a fun, culinary experience. The staff greeted us warmly and explained that we were in for a tasting treat starting with some new limited menu offerings. 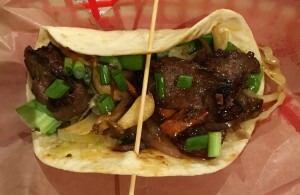 We began our adventure in Asian style street food with Chinatown Short Rib Tacos – The short ribs were served on a grilled flour tortilla. Glazed carrot, red onion, roasted garlic, bok choy, Chinese cabbage slaw were incorporated and the taco was topped with chopped green onion. Next up was a noodle dish. 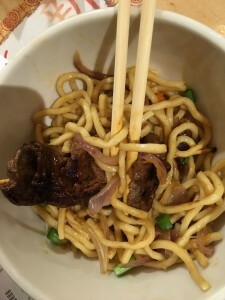 Peking Short Rib Noodles – Chinese “Peking” style BBQ short rib skewers with glazed carrot and red onion, soba noodles, bok choy, chopped green onion and roasted garlic, wok tossed in a roasted pepper sauce. 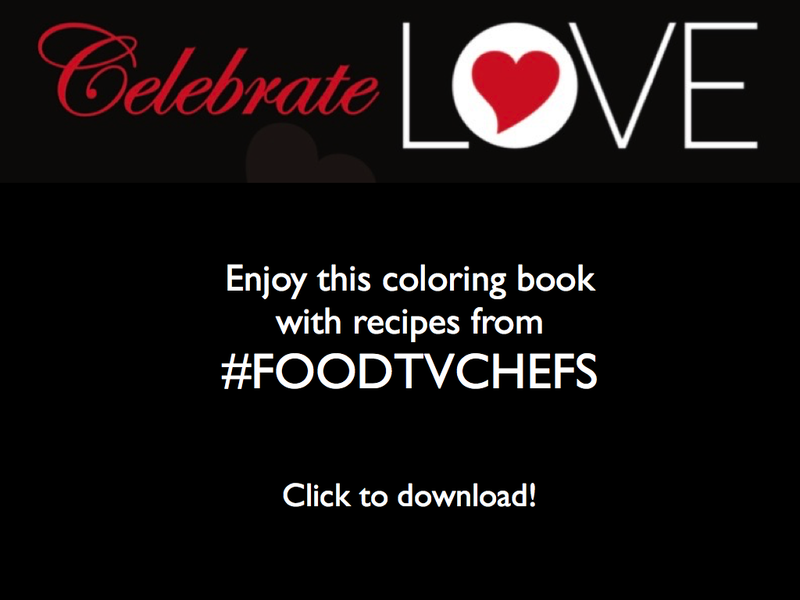 It was a real treat to meet Corporate Chef Kirk Biondi! Chef spent some time with us explaining the dishes we were served. For my entree I chose Mango Stir Fry. 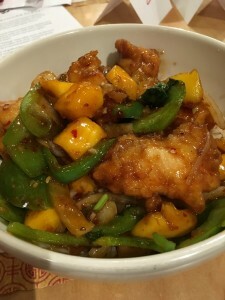 The flavor combination of sweet-chili sauce, fresh mango, basil, onions, bell peppers, jalapenos with crispy chicken was yum. My thoughts as I enjoyed the mango was it would be a great dish to have on a summer day. As wonderful as a meal might be, sharing food with friends is the ultimate pleasure. 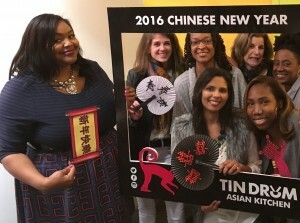 Hangin’ with some of Atlanta’s cool food bloggers at Tin Drum Asia Café. 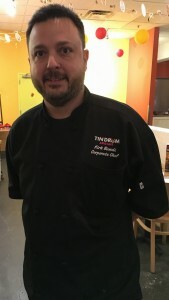 Tin Drum Asia Café offers multiple locations in metro Atlanta. There is also an expansion strategy to open restaurants in other states. The restaurant is family friendly with a special kid’s menu; there are also gluten free options. Connect with the Tin Drum Asia Café on Twitter | Facebook | Instagram. The meal was complementary as part of a blogger influencer program affiliated with Association of Food Bloggers. All opinions are those of the author.